As the capital city of New Zealand, Wellington has a lot of the mainstays that most capital cities have. The parliament buildings (the aptly-named ‘Beehive’) museums, and the national archives (you get the picture). But there is far more to Wellington than this. Known by the epithet of ‘the coolest little capital in the world’, Wellington sure packs in a lot for a city of just over 400,000 people! Of the most incredible sights? An eco-sanctuary of native species spanning over 500 acres…right in the middle of the city! In this post, we give you: The Zealandia Wildlife Sanctuary. As an ecosystem, New Zealand was completely isolated for thousands of years. The result is a totally unique mix of flora and fauna which you won’t find anywhere else. Sadly, this was hard-hit by European colonization in the 19th century. Introduced plants and animals wrecked havoc with the natural balance, and many species went extinct. There are 50 bird species alone that this country will never see again. The most famous being the giant Moa and the Haast Eagle (which had a wingspan of 3 metres and once hunted humans!) However, there are now considerable efforts to turn back the damage. Wellington is an area that was especially hard-hit by the degradation of native wildlife. Projects like Zealandia and nearby Kapiti Island are working hard to change this, and the results have been astonishing. Birds such as Tui and Kaka, once unseen and unheard in Wellington, are now a common sight in the suburbs. This is all the more amazing when you consider that these conservation efforts are a pretty recent development. New Zealand now has the ambitious target of making the entire country predator-free by 2050. When it comes to protecting native species, it really is a case of going big or going home! The Zealandia Wildlife Sanctuary is one of the jewels in the crown of New Zealand’s conservation efforts. Zealandia is part of a 500-year vision to integrate New Zealand’s native flora and fauna back into urban areas. The entire sanctuary spans over 500 hectares and sits in the suburb of Karori, right next to central Wellington. Since it began, Zealandia has introduced 18 native species back into the wider Wellington area. Many of these species have not existed on the New Zealand mainland for over a century! This truly is an extraordinary achievement. When we arrived at the Zealandia Wildlife Sanctuary, it felt like we were the only people there – and we were. Feeling overjoyed that we’d have the whole place to ourselves, we smugly headed towards the ticket office. Except… it was closed! Be warned dear visitor, this vast paradise doesn’t open until 10am. Although we felt a bit like we had wasted our morning, it was definitely worth the wait. There’s an additional charge for seeing the exhibit hall, which is incredibly interesting for foreign visitors who don’t know much about New Zealand’s unique wildlife. There are some great areas along the way where you’ll come across an array of buttons on a panel. Press any of them, and they’ll sound off some birdsong from one of the species represented at the Zealandia Sanctuary. Some of the folk became irritated with a tiresome little woman monopolising the panel (yes, it was me!) After his third attempt, Michael managed to drag me away. What struck me the most about the Zealandia Sanctuary is that this 550-acre valley of lowland forest and wetlands is so close to the city, yet feels so tranquil. My favourite spot (apart from the pushy button area) was the feeding station for the Kakas! 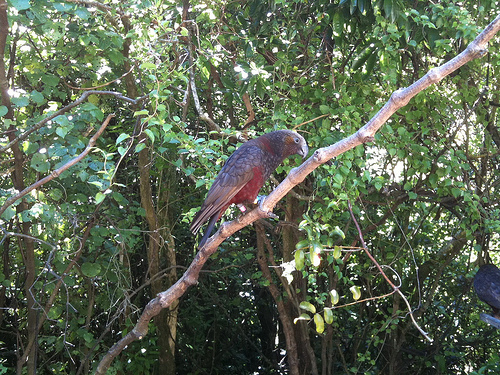 The kaka is a native New Zealand parrot, which has disappeared from much of the New Zealand mainland. It’s closely related to the Kea, its more famous cousin, though Kaka are much more widespread. They are however just as inquisitive! As these large parrots swooped past just a few feet above my head, I was convinced they might land there if I stood still for long enough! Actually, these cheeky birds left me feeling that their intellect may very well be superior to my own. For something a bit different, you also have the option of booking onto their twilight and night tours. These guided tours take place outside the regular hours, so you can have the sanctuary pretty much to yourself! Here, you will get to see native New Zealand wildlife settle into a new rhythm. Birds will start flying back to their nests, birdsong will change, and you might well catch a glimpse of nocturnal birds such as Kiwi! Zealandia is just a 10-minute drive from the centre of Wellington. There is a free shuttle from the central I-SITE, or alternatively you can take a public bus with Metlink. The sanctuary is open from 10am to 5pm daily. Last entry is at 4pm. 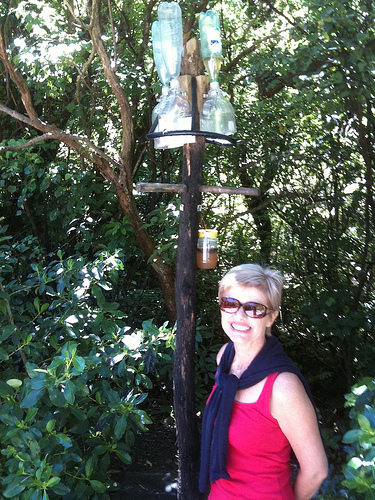 Definitely consider taking a break in the Rata Cafe – you will be surrounded by birdsong and great forest views! For more recommendations of eco tours and activities, check out our dedicated nature and lifestyle itineraries.